The Russian government has recently announced it will issue nearly $1 billion equivalent in state bonds, but denominated not in US dollars as is mostly the case. 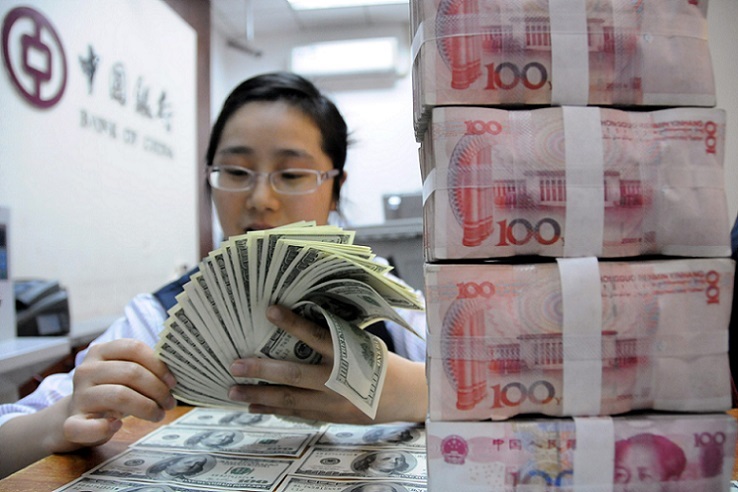 Rather it will be the first sale of Russian bonds in China’s yuan. While $1 billion may not sound like much when compared with the Peoples’ Bank of China total holdings of US Government debt of more than $1 trillion or to the US Federal debt today of over $20 trillion, its significance lies beyond the nominal amount. It’s a test run by both governments of the potential for state financing of infrastructure and other projects independent of dollar risk from such events as US Treasury financial sanctions. The steps to begin issuing Russian state debt in yuan are paralleled by another major development towards broader international yuan acceptance vis a vis the US dollar. On December 13, Chinese regulators completed final testing in preparation for launch of not a dollar-backed but rather a yuan-backed oil futures contract to be traded on the Shanghai Futures Exchange. The implications are potentially large. Since the 1970’s oil shock and the 400% rise in the oil price from OPEC countries, Washington has maintained a strict regime in which the world’s most valuable commodity, oil, would be traded in US dollars alone. In December 1974, the US Treasury signed a secret agreement in Riyadh with the Saudi Arabian Monetary Agency “to establish a new relationship through the Federal Reserve Bank of New York with the US Treasury borrowing operation” to buy US government debt with surplus petrodollars. advanced military equipment (purchased for dollars of course) and a guarantee of protection from possible Israeli attack. This was the beginning of what then-US Secretary of State Henry Kissinger called recycling the petro-dollar. To the present, only two oil export country leaders, Iraq’s Saddam Hussein and Libya’s Qaddafi, have tried to change the system and sell oil for euros or gold dinars. Now China is challenging the petro-dollar system in a different way with the petro-yuan. The China yuan oil futures contract now will allow China’s trading partners to pay with gold or to convert yuan into gold without the necessity of keeping money in Chinese assets or turn it into US dollars. Oil exporters such as Russia, Iran or Venezuela—all targets of US sanctions—can avoid those US sanctions by avoiding oil trades in dollars now. This past September Venezuela responded to US sanctions by ordering the state oil company and traders to make oil sale contracts in euros and not to pay or be paid in US dollars any longer. Now Russia or Iran or other oil producers are in a position to sell oil to China for yuan or rubles, bypassing the dollar entirely. The shift is about to take place in the coming weeks as the yuan oil futures contract is officially launched. Further in October, China and Russia launched what is called a payment versus payment (PVP) system for Chinese yuan and Russian ruble transactions that will reduce settlement risk for oil and other trades. Already reportedly Russian oil and gas sales to China are being conducted in Ruble and Yuan and since the foolish US effort to isolate Qatar in the Persian Gulf, Qatar, a major LNG gas supplier to China, has switched to pricing in yuan. Pressure is growing that, at some point, Saudi Arabia breaks its 1974 pact with Washington and sells its oil to China also for yuan. A new element is about to be added to the growing cooperation across Eurasia centered around China and Russia, namely Iran. According to Behrouz Hassanolfat of Iran’s Trade Promotion Organization, in a statement carried on Iranian state-owned Press-TV, as early as February, 2018 Iran is set to become a member of Russia’s Eurasian Economic Union (EEU). Presently the EEU, created in 2015, includes Russia, Kazakhstan, Belarus, Armenia and Kyrgyzstan to create a large zone for free transit of goods, services, capital and workers among member states. Presently the EEU is a market of 183 million people. The addition of Iran with its more than 80 million citizens would give a major boost to the economies of the EEU and to its economic importance, creating a common market of more than 263 million, with skilled labor, engineers, scientists and industrial know-how. Iran has already announced, in the face of escalating threats from Washington, that it seeks ways to sell its oil for non-dollar currencies. Integration into the EEU could bring a solution to this as Iran, Russia and China inevitably draw closer in face of relentless US pressures on all three. Increasingly in proportion to the pressure from the West, the nations of Eurasia are developing modes of growing their economies independent of US Treasury financial sanctions. In retrospect, it’s likely that those US sanctions will be seen as one of the more stupid attempts of Washington to dominate the economies of Eurasia.